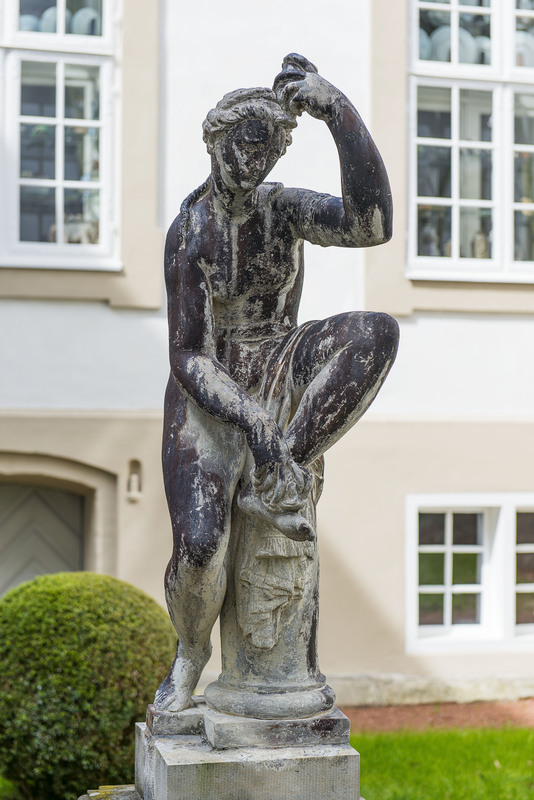 In a small courtyard at Fredensborg Palace, one of HM the Queen of Denmark’s favourite residences, stands a statue in lead, called Bathsheba. The statue is of old provenance, perhaps it was already here in the 1720’s when the palace was built and the gardens laid out. It is old knowledge that Bathsheba is a copy of a marble sculpture, made around 1570-72 by the famous renaissance artist Giovanni da Bologna, called Giambologna (1529-1608). That was basically all we knew about it in the Agency for Culture and Palaces. In the spring of 2017, the Agency received an inquiry from the German art historian Dorothea Diemer concerning the Fredensborg copy. First of all, she could tell us that the statue was probably supposed to depict Venus, not Bathsheba. Secondly she believes the sculpture to be a cast of an original marble statue. She therefore wished to hear, what the Agency for Culture and Palaces knew about its history. The following research in the Danish State Archives did not, however, lead to any conclusive evidence as to the origin of the statue. It did reveal though, that there once was another copy in Denmark. It stood in The Rosenborg Castle Gardens up until 1804, where it became so dilapidated, that it was discarded. The whole issue unveiled a fascinating story about the arts in the renaissance and baroque era. The original marble sculpture testifies to the fact that the art scene at the time was truly European. The sculptor was a French speaking Fleming who worked in Florence. 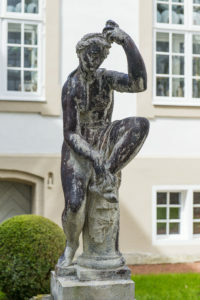 It was given as a present to the elector of Bavaria, who probably placed it in the Munich Palace Gardens (quite possibly as a fountain, since traces of rust suggests a jet leading from the foot to the flacon in the figure’s left hand). In 1631, during the 30 Years War, Munich was looted by Swedish troops lead by Fredrik Stenbock and the marble statue was taken to Sweden. It remained in Sweden for the next 350 years, until it was bought in 1982 by the J. Paul Getty Museum in Los Angeles. Several casts of the original are to be found around Europe today. All the casts show a flacon in Venus’ left hand that is different from the marble original. We know from late 18th century sources that the left hand of the original was damaged and subsequently restored. The present flacon was added during a restoration in 1981. Furthermore, the bronze copy still existing in France is dated 1697. Since this cast is similar to the casts in lead and plaster in Ericsberg manor in Sweden and the lead cast in Denmark, they are probably all made during the same time. What is more, on all the casts lesser modifications have been made. For example the left hand has been moved closer to the body, which could suggest that the cast was intended to be made in lead. Lead is relatively soft, so the modifications would have been made in order to prevent the arm and other members succumbing to their own weight. We do not know how the cast of Bathsheba – or as we now can call her – Venus ended up in Fredensborg. The time around 1697 points to a period of peace and even friendship between Sweden and Denmark, two otherwise rivalling kingdoms. Furthermore, this period saw a rich artistic connection between the two countries. A key figure was the Swedish court architect Nicodemus Tessin t. Y., whom we know found Denmark lacking modern sculpture. Perhaps it was he, who arranged for the Giambologna copies to come to Denmark? In that very year of 1697, a ship left Stockholm to take the architect’s model for a new palace to Copenhagen. Perhaps the ship also carried two copies of Giambologna’s Venus? See more about the Giambologna copies at burlington.org.uk. This account is a summary of a publication in Danish, which can be found on the homepage of the Agency for Culture and Palaces: https://slks.dk/publikationer/. For further information, please contact Kent Alstrup: kenal@slks.dk.